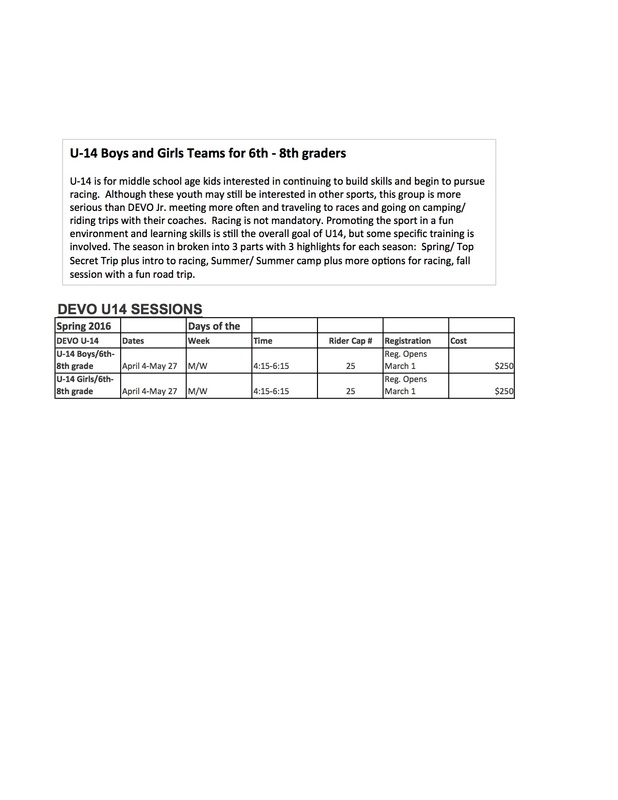 DEVO Fun Race Wednesday May 25th! Buckley Park! COME CELEBRATE A GREAT DEVO SEASON! Dunk Tank – kids get to dunk their coaches! Zia Days this Weekend May 14th and 15th! Zia Taqueria is hosting a Benefit Weekend for Durango DEVO at both North and South locations on May 14th and 15th. A percentage of Zia Taqueria’s weekend sales will go to help Durango DEVO in it’s 10th year to continue supporting it’s mission of “building life long cyclists on ride at a time.” Bike on down to either Zia location on May 14th and 15th to support Durango DEVO your local youth biking organization. Never Forget the FUN! #NFTF. Raffle tickets on sale NOW online.. The Durango Devo Van Fund Raffle is continuing ONLINE until May 29th at which point the winners will be draw for the 2016 TREK Stache 9 and Fuel EX Jr. Mountain bikes. Tickets will also be on sale at the Stillwater Party in the Park at Buckley Park May 21st, and at the Junior DEVO Fun Race on May 25th in Buckley Park! Get em know while you remember! Thanks to TREK for supplying the bikes for the 2nd year in a row! Thanks to them we have vans to transport kids across the county, state and country to ride bikes! CLICK BELOW TO GET YOUR TICKETS!! Wednesday May 4th officially kicks off the 2016 Zia Town Series with the Hogs Foot Circuit race! 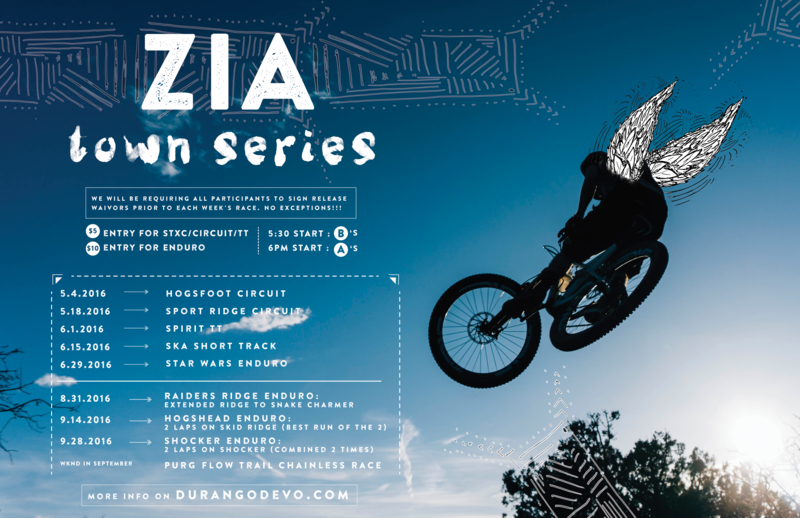 The Ska Zia team with Durango DEVO offer these races for the community! We would love to see you come out and race, ride or experience the fun! 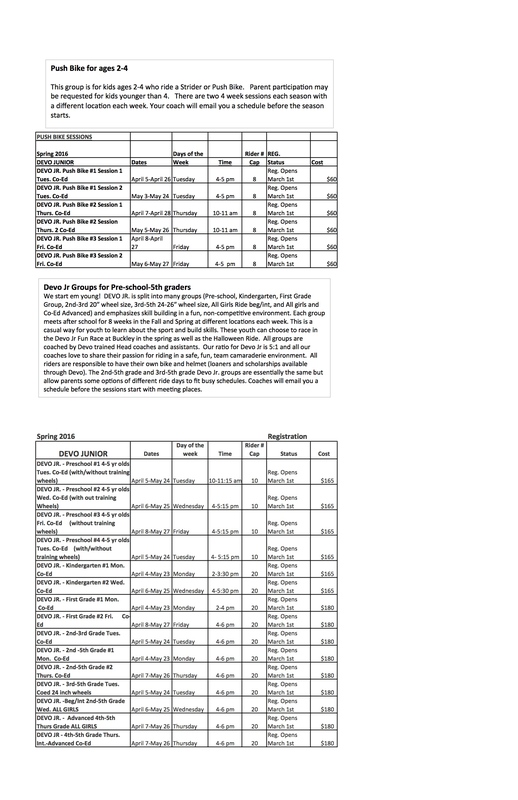 The first half of the season is more endurance oriented, then a break in July and August, followed by the final half of the series wrapping up in September. Below is the list of volunteer duties as well as race info. Volunteer Spots for May 4th….. Course: Counterclockwise laps on Hogsfoot with the start/finish running through the flats of the old town dump. 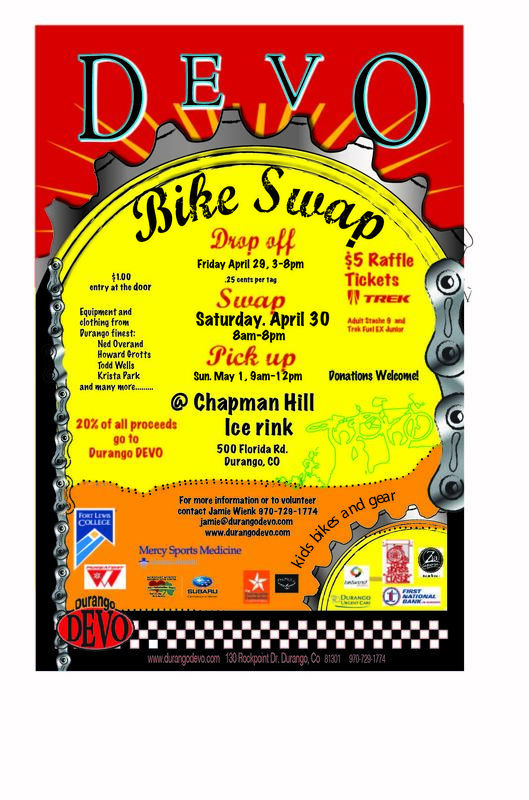 DEVO Bike Swap April 29th – May 1st Buy, Sell Volunteer! Are you a bike lover and in need of purchasing anything bikes. Do you need to clean out your garage of all thing bikes? Come on down to Chapman Hill Ice Rink April 29th and 30th to buy, sell or volunteer for Durango DEVO’s largest fundraiser of the year! 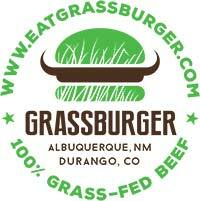 20% of sales go to Durango DEVO. Come and check out gear from Howard Grotts, Ned Overand, Krista Park and more! Raffle Tickets on sale for $5 for 2 Bikes Trek Bicycle Fuel EX Junior, and Adult Stache 9. Drop off gear 3-8 Friday April 29th, Buy April 30th from 8-8. Pick up unsold items 9-12 Sunday May 1st. Sign up to Volunteer at here. A HUGE thanks to all the dedicated DEVO sponsors for making a DECADE of Devo! Fort Lewis College Mercy Regional Medical Center Osprey PacksDurango Urgent Care 2nd Ave Sports City of Durango – City GovernmentPurgatory Resort Zia Taqueria Iron Horse Bicycle Classic Mountain Bike Specialists Tailwind Nutrition First National Bank of Durango Morehart Murphy Regional Auto Center Subaru of America, Inc. Bread Sunnyside Meats, Inc. Nature’s Oasis Target Rental/Bobcat of Durango #NFTF Click poster for details! When your ready, click the camp you want to register for and you will be directed to the registration page then click register now, upper right. This camp is designed for Preschoolers to get 4 days of riding in a row. You will see your little cyclist take strides in their riding throughout the week and and see big smiles riding with their peers. Must be riding a bike with pedals. No Strider bikes please. Like biking? Like science? We have found your dream camp! Week-long camp combining mountain bike exploration in the mornings, and bike-related hands-on science at the Power House each afternoon! In this lab portion, explore topics including anatomy and physiology of biking, nutrition, bike engineering and simple machines, physics of biking, and more. One thing’s for sure: your kids will sleep well after each day of this camp! Register with Devo at www.durangodevo.com. Registration for this opens April 11 at 7:00pm. Participants must have a helmet, a bike with hand-brakes, and some experience on a bike. Scholarships are available through the Powerhouse. Please get form here. The Devo camp will be held at Purgatory at Durango Mountain Resort in one week segments Beginning in late July. The camp is for ages 7 -14 year olds. Kids must have their own bike and helmet (Devo does have some loaners). The camp runs from 9-3pm with transportation in the Devo vans from the transit center in downtown Durango (bikes loaded on Devo racks). Pick up 8:30 at Transit Center and 8:45 at Hermosa. Drop Off at 3:30 at Hermosa and 3:45 at Transit Center. Other camp activities include; special guest appearances, gravity skill sesh, bike fit, trail building, family ride for int/ advanced with shuttle support on the classic five star Hermosa Trail. Bike Polo camp is for ages 10-18 to explore the sport of Bike Polo. Practices will include learning rules of the game, tactics, bike handing and ball handling drills, live games and building a mallot and will be coached by Alex Howard with special guests. You do not have to be a current Devo rider to participate. All levels welcome! Practices are at Buckley. Limit to 16 campers (4 teams of 4). Monday-Friday, June 11-July 1 with a trip to Crested Butte for a bike festival June 24th-26th. Costs: $450 (does not include food, race fees or camping costs). Description: DEVO U14 is for middle school age kids interested in continuing to build skills and begin to pursue racing: Racing is not mandatory. Promoting the sport in a fun environment and learning skills is still the overall goal of U14, but some specific training is involved. The summer season will be a 3 week “training camp” which will have one travel fun trip to Crested Butte for the Crested Butte Bike Week. The group will be co-ed and limited to 13 riders. Head coaches Tina and Lee will lead these groups with help from other Devo coaches. Each day will focus on a skill and a trail. We will incorporate polo, bike maintenance, short tracks, time trails, and lots of skills! Volunteer for the DEVO Bike Swap! We’re using VolunteerSpot (the leading online Sign-up and reminder tool) to organize the DEVO Swap volunteers. Find the sign ups here. 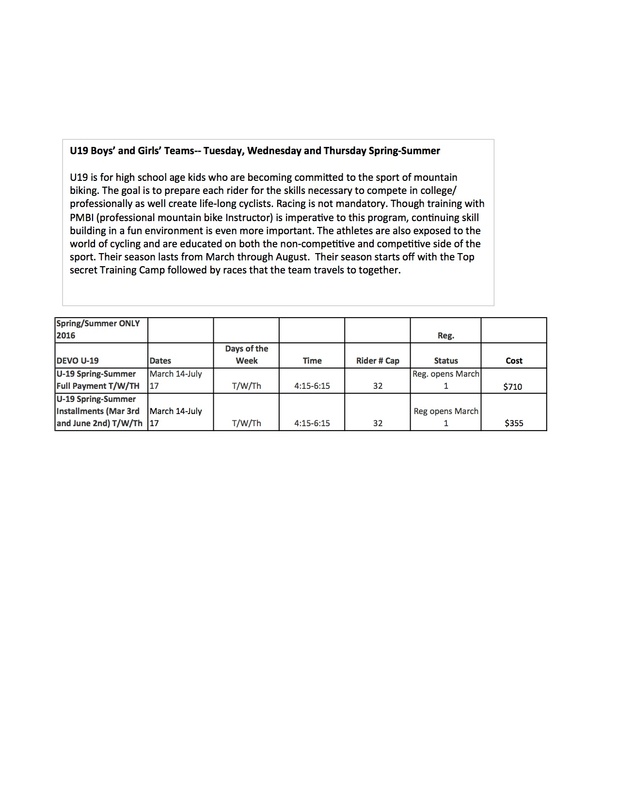 Junior DEVO Registration March 1st @ 7pm…. 2016 Spring schedules posting soon!